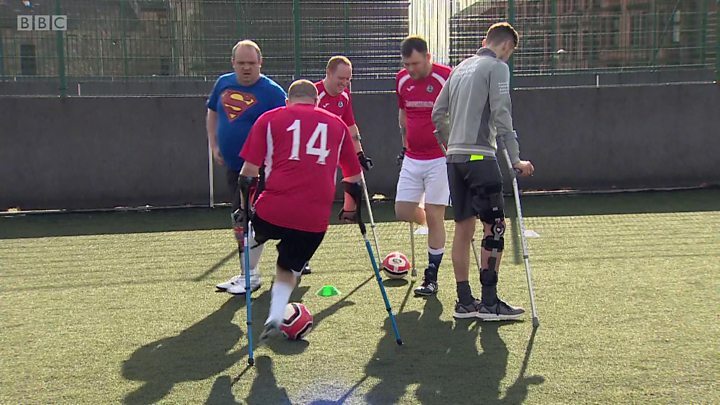 Amputee football is played all over the world but it is in its infancy in Scotland, where organisers are trying to form a new league. "It gives me a lot of confidence and a lot of good friends," says one of the players on a five-a-side football pitch in the north of Glasgow. He's moving around nimbly on crutches, putting everything into the training and drills. There are shouts for the ball, plenty of laughter but lots of hard work. After all some of the players here have their next competitive game in just over a week. Many of them do play on crutches, others with prosthetic limbs. The sport of amputee football has been going for many years south of the border and now a charity is now trying to form a Scotland-wide league. It is holding the first amputee football Scottish Cup in Edinburgh next month. This team I am watching is linked to Partick Thistle. "I wish, looking back, I hadn't let it stop me," says Brian Murray, who lost his leg to cancer at the age of 10. He says that, although as a youngster he did play on crutches with his pals, when he went to secondary school he lost confidence and began wearing his prosthetic leg all the time. His introduction to amputee football was in England, regularly travelling to Everton to get a game. It is rough at times - he broke his collarbone last year, but did not let that put him off. He describes the sport now being in Scotland as "brilliant". "That's what I want to give to youngsters," he says. "Don't let anyone stop you, just go for it." He adds that if he is still playing at the age of 47, then "it doesn't matter what age you are". Amputee football is played all over the world. In Turkey, for instance, there is a professional league, aired on television with 600 players. Scotland is hoping to play some friendlies against other European countries later in the year. "Amputee football is just about getting people out and playing football," says Ashley Reid of the Amputee Football Association Scotland (AFAS). "The limb difference, the amputation is not relevant at all when people are here training. It's just about playing football." She says she saw a clear demand for the sport in Scotland. The task now is to try to spread out across the country. In among the men on the pitch is one woman. In fact, she is the only woman playing in the amputee football league in the UK. "All amputees are used to being the odd one out in the crowd," Rebecca Sellar explains. "So coming into this as the only woman, you get on with it and over it." She would like to get more women involved. Rebecca says that since she started she has been welcomed into the game and on a personal level has gained fitness as well as the enjoyment of taking part in a team sport. She says: "Our numbers are growing and the more word we can get out there to encourage people to get involved the better we can have it as a sport for Scotland."